Cellion primax is the world’s first hearing aid built around lithium-ion technology. Signia has answered the call from consumers to design hearing aids that are simultaneously easy to use, reliable and fast, and updated to match the convenience and speed of our other personal electronics. Using lithium-ion inductive charging technology, Cellion primax eliminates the need for batteries. As with other devices, such as are smartphones, Cellion begins charging as soon as it is placed in the charger and automatically turns on when it is removed from the power source. Cellion primax is chock full of Signia’s most advanced hearing features, as well as an innovative rechargeable energy solution. Hearing technology, as with all of the other devices in our lives, continues to grow smarter and faster with every new iteration. Though rechargeable hearing options have been available for decades, Cellion primax updates hearing aids to the powerful levels we see in our smartphones and laptops. While this technology seems commonplace to us now, keep in mind that many traditional aids on the market still require regular battery replacement. The use of traditional hearing aid batteries comes as a cost to both the wearer and the environment, over time. With new digital and wireless capabilities, hearing aids nowadays require more energy than before. This means that wearers are required to replace their batteries more often. Dead batteries end up in landfills, where they will seep lead and other dangerous chemicals into the ground, affecting soil and water sources. With Cellion primax’s lithium-ion inductive charging option, wearers need not worry about changing batteries and disposing of them safely. Instead, Cellion’s simple OneShell design has contactless, inductive charging that eliminates the battery door and contacts of older models. The lithium-ion power cell lasts up to five years, approximately the average life of a hearing aid. If you need the power cell replaced, your hearing specialist will take care of it! Cellion primax’s lithium-ion technology brings another important benefit: confidence in your device’s power. With traditional hearing aids, you may find yourself running out of battery power at an inopportune moment, only to find that you didn’t bring a spare pair of batteries. Cellion primax delivers 24 hours of continuous clear hearing and unlimited streaming on a single charge. Cellion primax comes with a user-friendly charging pack, complete with a micro USB charging option and a simple on-off program that automatically activates when plugged in and deactivates when unplugged. Additionally, the charging back comes with a dehumidifier, to remove any moisture that collects throughout the day. For 24 hours of unlimited listening, Cellion primax requires only four hours of charging. If you’re in a rush, Cellion primax provides a confident fast charging option – 30-minutes charge for seven hours of listening. Signia offers on-the-go power packs as well, in case you need a quick charge while you’re out and about. 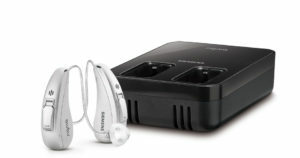 Rechargeable hearing aids are the natural next step for hearing aid technology. Designed based on your reliable and advanced smartphones, tablets, and laptops, Cellion primax is easy to use and ensures a confidence, worry-free listening experience so that you may focus on the things that are important to you. SpeechMaster is Signia’s speech recognition feature that assists with clear speech intelligibility. With directional microphones, Cellion primax focuses on the speakers you want to hear, helping to improve speech understanding in noise. The primax platform is equipped to deal with many different sound signals in your environment; it analyzes and mixes sounds at an incredibly fast speed, allowing you to focus clearly on the speech you want to hear and reduce background noise that would be distracting. EchoShield is a creative feature that addresses a common but often overlooked difficulty for hearing aid users. With extra amplification of sounds in your environment, there are certain spaces that could prove acoustically challenging. For example, lobbies, atriums, hallways, and other cavernous spaces could create echoes that muddle the sounds you receive. EchoShield protects sounds from this distortion through a number of fast algorithms. EchoShield ensures that primax hearing aids deliver comfortable and natural sound – no matter the environment. As a wireless hearing aid, Cellion primax can be connected to your smartphone through the touchControl app and the Signia miniPocket remote. These options allow wearers to discreetly change program features and adjust volume settings. Signia also offers audio streaming and remote control functionality through easyTek accessories and the easyTek app. Cellion is an incredibly durable hearing aid, with an IP rating of 68. The construction and materials used for Cellion keeps out most dust, moisture, sweat, and other elements that could harm the electronic components. Also in terms of construction, Cellion is designed to be user-friendly, with a simple push button for manual program adjustments. Signia is the newest brand from Sivantos Group, parent company to leading hearing aid manufacturers such as Siemens. Signia is built upon technology from Siemens, such as binax, the first hearing aid to outperform normal hearing in challenging noise situations. Since its debut, Signia has introduced some of the most advanced hearing aids available on the market. The primax line of hearing aids includes the above Cellion (receiver-in-canal style), the Signia Silk primax (ready-to-wear, completely-in-canal style), and the greater primax family which includes in-the-ear and behind-the-ear options.